Lady Indians’ shortstop Keely Giesy jumps to hug her mother, Michelle, following Osage City’s championship win saturday at Twin Oaks Complex in Manhattan. The Lady Indians won two of three team sport titles this year. MANHATTAN—Whoever said two out of three ain’t bad was wrong, or at least vague, according to Osage City senior Carly Spicer. 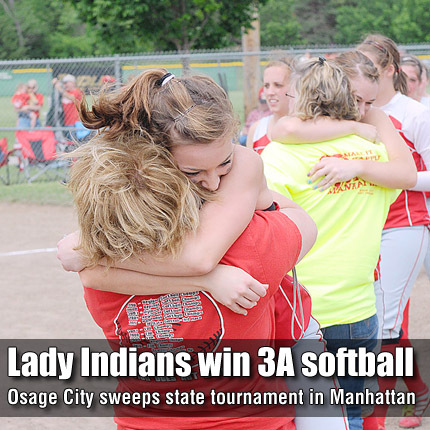 Spicer and rest of the senior-driven Osage City Lady Indians’ softball team took a slow start into a dominating finish as the Class 3A Tournament Friday and Saturday at Twin Oaks Complex in Manhattan, winning their second of three state tournaments this year.